Clinical Pharmacology Notes for Medical Students! As a medical student, you must have a thorough knowledge of clinical pharmacology. Understandably, medical students find this task challenging. It means learning the science behind medicines and marrying this knowledge to real-life, clinical practice. It takes time, often years, to commit these facts to memory. But it doesn’t need to take this long. That’s why we’ve developed a comprehensive range of pharmacology notes for medical students – study resources that filter through the essential, insightful, relevant facts that inform your clinical judgement. No waste, no filler, no endless reams of condensed text. Together, these resources provide the medical student with everything they need to know about clinical pharmacology – sets of pharmacology notes for medical students that are comprehensive, up-to-date and cater to the specific needs of students. Clinical pharmacology is the subject that underpins the science behind medicines and its application in the real-world, clinical setting. That’s what makes clinical pharmacology challenging; it emphasises the hard science of medicine – from molecular targets and biochemistry – and the quantitative science of how drugs affect a target population. Clinical pharmacology is a complicated, multifaceted subject that requires intense study. Knowing what to study is often more important than knowing how to study. That’s where our pharmacology notes for medical students come in. Instead of blasting the student with an interminable blizzard of facts, we’ve sought to create resources that only provide the essential, relevant facts. You don’t need to spend time creating notes, we’ve done the hard work for you. That’s why we’ve fast become the leading pharmacology website on the net. More students than ever are now joining our immense body of members; realizing that they don’t need to waste tens of hours each week, coming out the other end with very little results. Our pharmacology notes are guaranteed to improve your grades. Our pharmacology study guide approaches the subject from many different angles. Not all students learn the same way. Some students prefer to use visual means, such as flashcards or mnemonics or infographics. Other students prefer to test their knowledge, using quizzes. Others prefer writing notes or reading tutorials. No matter what study method you prefer, our resources are tailored to help you. One of the great advantages of our study packages is that they’re consistently kept up-to-date. New content is added each week as we add more relevant detail to further enhance your grades. And as our body of registered members can attest, we make clinical pharmacology an enjoyable experience. You don’t have to spend hours and hours with your head between a 10-kilogram textbook to pick-up and absorb the relevant facts! By constantly exposing your study to fact after fact after fact, the facts begin to stick – and stick very quickly. Our pharmacology notes for medical students have been designed by experienced professionals within the medicine industry – physicians, pharmacists and academic personnel – bringing you crystal clear facts about medicine. Clinical pharmacology doesn’t need to be difficult. With the right study guides, the right approach and a positive frame of mind – you’d be surprised how this trio can transform your understanding of drugs and medicines. We’ve made studying medicine easy. We hope that you join our ever-growing body of medicine students to appreciate that fact. 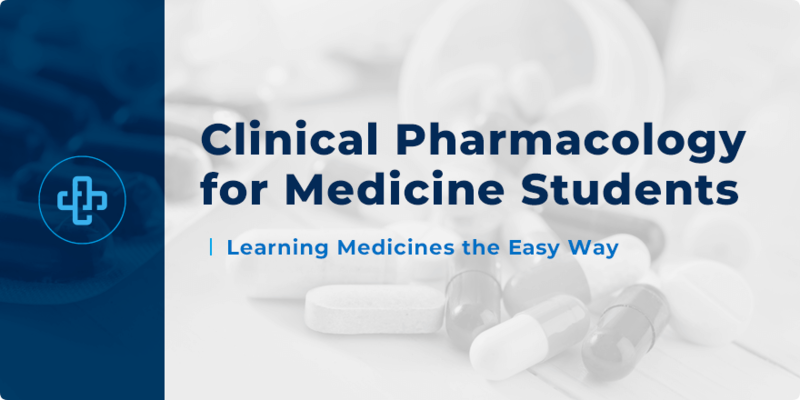 If you have any questions about our clinical pharmacology notes, we’d love to hear from you! Fill out our online form today and a member of our team will be in touch very shortly.